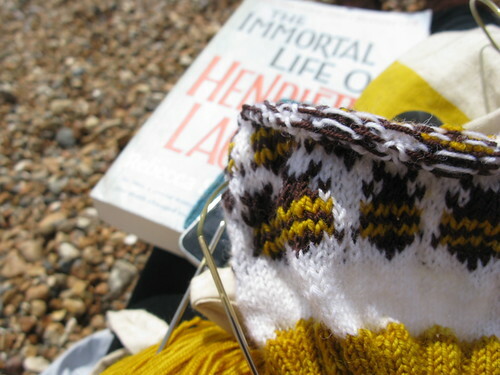 Here I am on Brighton beach, with my newly knitted socks. 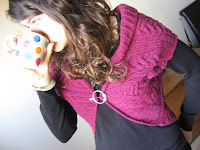 Full knitterly details like yarn, etc on ravelry, this post'll explain why I knitted them. The bobbles running up each side are organised to represent the word "yakawow" in braille. Back in mid-April, the Times published an interview with controversial scientist, Baroness Greenfield. She'd said all a whole host or objectionable and/ or funny things in this interview, and people were chipping in with their favourite bits. "Crowd reading", if you will. Someone quipped "She's right abt 1 thing: we don't want "load of breezy people who go around saying yaka-wow". Cos that would be MENTAL". Another replied with "Yaka-wow must used more! Dunno its meaning but ace phrase". They were clearly onto something. I logged into twitter a few hours later, after a very serious evening discussing the role of science communication in the developing world, to discover a @yakawow account was now following me. (I still don't know who is behind this account, though I have my suspicions). There were also tshirts for sale, a youtube video, various photoshopped images and facebook page. It turned out Greenfield didn't coin a new term. It was a transcription error of "yuck and wow", a phrase Greenfield has often used to describe the way people act online, running quickly from one sensation to another. Greenfield is (in)famous for her concerns that computer games and social networking sites are damaging our brains, leading to short attention spans and an inability to empathise (e.g. see this news piece). This makes more sense than "yakawow", but Greenfield's views on computers is not without its critics (short version: all very well as an idea, but it lacks evidence). The yakawow meme kept running. It was Boing-ed. Quick to celebrate the new word they had invented, the The Times wrote about it (see also this cartoon, from print version). The New York Times vocab blog picked it up and apparently it's in the latest edition of Wired, though I haven't see a copy yet. One of my old students challenged me to knit yakawow. It had to be socks. Greenfield famously referred to twitter as "reminiscent of a small child saying "Look at me, look at me mummy! Now I've put my sock on. Now I've got my other sock on". I also thought the word would provide an opportunity to play with knitting braille, something I'd been thinking about trying for ages. I worked three panels of the word, loosely reflecting the streams of code in the poster for the Matrix (a play on Greenfield's suggestion that computer mediated communication is somehow not real). I knitted them one at a time, rather than two-at-once-on-a-huge-circular to mirror Greenfield's point about people on twitter saying they'd put on one sock and then another. They were also from the bottom up: read something into that if you want, I can't be bothered to extend the symbolism any further. Baroness Greenfield, take note. These people’s brains haven’t atrophied yet. They have taken your interview and created a whole new universe. I think, therefore I yaka-wow. Still, it can be nice to have a break from it all. Which is why although this photo was taken on Brighton beach on Monday, I didn't blog about it until today. I've been away from the internet, reading a book and knitting a legwarmer. I also took those socks off and went for a bit of a paddle. Can I repeat my self and say how much I love to see my bumblebee-pattern travelling to Breezy Brighton? This whole yakawow thing went by totally unnoticed by me. I'm a very selective person when it comes to all online sites and so far blogger & ravelry are enough (I'm closing down my flickr account as I don't see a point in that anymore). I think the internet provides many exciting opportunities for everyone and it's really only silly to go around criticizing all of it. Thanks Pinneguri! I think that you noticed your pattern and were happy to see it traveling to Brighton commented proves the point about the connections between online and "real" worlds. I love that the web lets me see people knitting my patterns too. haha, that's a wonderful reason to knit the socks like that!! they are amazing. And I love the colourwork you're working on, too! Both socks, beeless and with bees, are awesome! Great post. I'd write a longer, more reasoned comment but my attention span has collapsed from too much Twitter and I have just spotted something shiny. And don't knitted socks look lovely on the beach? This a marvellous post! Lovely socks too. As we all known, Hollywood stars are not only wearing have a grade, and any time looks very attractive.Why Because they usually like to wear oakley sunglasses to charm and add to the mystery. So choosing a suitable sunglasses is very important to us. I found a great deal of helpful info here! WOW!! Such a amazing information have you shared over here. This is really a great blog have you written.I really enjoyed reading your article.I will be looking forward to read your next post. Nice post once again. Thanks for sharing this kind of informative post. No fax payday advance is a fleeting credit which is typical of high loan fee.